No queues and accessible services of European quality – we are talking about the Administrative Service Centre of the Tiachiv amalgamated community located in Zakarpattia Oblast. At the moment, local residents are able to not only get the necessary municipal services quickly but to also apply for an ID-card and biometric passport. Due to the network of special representative agencies available in the localities, these services can be accessed even by residents who live in remote villages. Decentralization is one of the most dynamic reforms in Ukraine. It relates not only to amalgamation of communities but also to the enhancement of quality of administrative services in the localities. These exact purposes lead to the further establishment of Administrative Service Centres (ASC). Regardless of the location of the client's residence, he/she will receive all necessary services in a "single window" without having to address different establishments of the town or region. The debutants of the administrative services reform, which was initiated back in 2012, include the largest regional centres of Ukraine, where a unified system of services provision aimed at eradicating corruption risks was created. This process received an additional boost after the Revolution of Dignity in 2014, when it became clear that the main cause of corruption is the old bureaucratic system that enabled officials of various ranks to receive money illegally for the provision of services. At the same time, the population spent a considerable amount of time on troublesome running from one administrative institution to the other. An important role in the realization of changes is played by international institutions, which implement large-scale programs aimed at the establishment of modern centres of administrative services. One of these is the U-LEAD with Europe Program funded by the European Union, particularly by countries like Denmark, Estonia, Germany, Poland, and Sweden. This Program is aimed at supporting decentralization and improving the quality of provision of administrative services in unison with bringing them closer to the population. Viktor Tymoshchuk, an expert of the U-LEAD with Europe Program, says that the team has used the best Ukrainian and Swedish experience of provision of administrative services: "We have identified and determined the core characteristics of a modern ASC, by which we were guided in the process of creation and modernization of the Centres. The following are among important elements: provision of a proper list of services and their availability for everyone in the format of a "single window," barrier-free open space, convenient reception hours, and geographical convenience of location. Besides, modern minimalist design for the Centres was also developed." What makes the creation of such a centre in the city or community so favorable? Volodymyr Feskov, an expert and a counselor for the decentralization of the Zakarpattia Centre for the Development of Local Self-Government, draws attention to the advantages of a ASC for the communities: "One of the priorities is to bring the provision of services closer to the population and make them adhere to quality standards. Under these conditions, the residents of such rural amalgamated communities will no longer have to commute several kilometers to reach the city centre and get the required service. It has now become possible to arrange all municipal services locally in villages, which signifies the implementation of the principle of availability. When a person spends a minimum of time and resources on commuting, communicating with officials, running from one place to another, collecting documents, and clarifying the procedures, this is the very principle of transparency as a person will go to a specific window or table and submit the required documents, which are minimized. The worker in administrative services, on his/her part, is supposed to accept and review the documents. If there are any remarks, he/she will do everything possible to eliminate any inconsistencies in the shortest time possible." 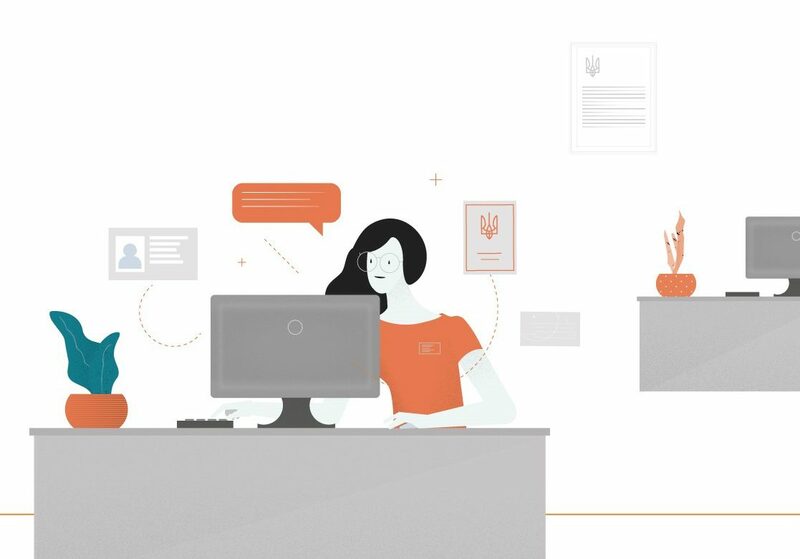 The advantages of Administrative Service Centres are already being enjoyed by several million Ukrainians. More than 740 centres have already been established on the territory of the country. As of December 2017, there were 71 Administrative Service Centres and remote workplaces in the amalgamated communities. Tiachiv local amalgamated territorial community, which was established on 21 August, 2015, can boast of the successful implementation of this reform. Despite the difficulties that came alongside implementation of decentralization in Zakarpattia Oblast and the blockade against ATC establishment in Zakarpattia Oblast, this community has demonstrated its resilience and consistency with the principles, thereby providing a role model for Zakarpattia of how a new modern community should function. The ASC situated in the former courthouse was founded on 23 September, 2017. It should be mentioned that its opening was preceded by troublesome preparatory work since the application for the creation of Tiachiv ASC was selected as a result of an open competition within the U-LEAD with Europe Program. Since then, Tiachiv ASC has had something to boast about. Volodymyr Feskov shares his impressions: "This is a good role model of ASC, which is one of the best in Ukraine. When you enter the building, it feels as though you are in Europe. Here one can arrange not only land documents or other municipal services but also apply for a biometric passport and an ID-card." Tiachiv community was the first one among all ATCs whose ASC saw the establishment of equipment for issuing internal and international passports. This service was introduced approximately two months after the institution was established. According to Viktor Tymoshchuk, a representative of the U-LEAD with Europe Program, it was done taking into consideration the special demand for this type of service. Diana Ivasiuk, who has been the chief executive of the Tiachiv local ASC from its very establishment, says that she consults with employees of the successful Lviv and Ivano-Frankivsk ASCs on a regular basis. She believes that the core task of her team is not only to quickly and qualitatively process documentation but also to eradicate queues. Therefore, they have established an electronic queuing system in the Tiachiv ASC. The head of the ASC says, "This is a very convenient thing both for us and our clients. Thanks to it, unlike ordinary OVIRs (Births, Deaths and Marriages Registry Offices), where the queues for the submission of documents for passports are already formed by April-May, people can submit similar documents by us within one week from registration." In addition to the issuance of passports, the ASC provides services of the department of land issues regulated by the Tiachiv city council (architecture, city planning), services of real estate and business registration, as well as registration by place of residence. Diana Ivasiuk says that they plan to expand the list of services in the future, particularly by adding the service of StateGeoCadastre, transport registration, and even civil registration services. The head of the ASC of the Tiachiv ATC sums up by saying: "It is important to organize work in such a way so that people can get all the necessary services in one place." The benefits of the Centre were even felt by the smallest residents of the community. For example, Ivan Manko, a resident of the village of Lazy in Tiachiv ATC, says that he is impressed by the effectiveness of ASC: "I am registering my children and grandchildren to my place of residence. I am pleased that there are no queues and really happy that I will get this service in a matter of minutes." The biggest positive aspect is that the residents of Tiachiv local community enjoy the opportunity to get services directly in their places of residence – in remote workplaces. They are located on the premises of village elders in the villages of Tiachivka, Lazy, and Ruske Pole. Diana Chulei, who works remotely in Ruske Pole, says that her job here started in January 2018. Since then, around 3-8 people have come to the village elder to get the necessary service. "Remote workplaces are convenient as people do not have to commute to Tiachiv and run from one administrative institution to the other. They ask me for help, consult with me, deal with their land issues, problems they encounter because of streets being renamed or change of house number, get services of documents application for their building, and submit the necessary documents for the registration process. Moreover, there is no longer a need to commute to Tiachiv to register a newborn child. There is a special program, which is the same as in the ASC." Diana Chulei draws attention to the fact the rural residents treated this reform in different ways: "Changes begin with each of us. Young people understand and accept changes easily. For an older generation, it is harder to understand these process as they got used to old, Soviet traditions of how administrative institutions work. Still, it will all change with time." Ivan Kovach, the city mayor of Tiachiv, is also positively disposed to the implementation of these changes. He noted that the ASC was created with the single aim of making the state administrative services more accessible to consumers, the residents of ATCs. After all, the creation of European-quality conditions for residents is one of the core purposes of decentralization. The success of the Tiachiv ATC is closely observed by their neighbors – residents of the neighboring Vilkhovets rural ATC. This community has long had ambitions to create its own Centre for the provision of administrative services. Mykhaylo Tsiryk, the head of the community, says that, during the last session, the deputies of the village community decided to create the Centre for the provision of administrative services. According to Mykhaylo Tsiryk, "The regulations on the activities of the Centre as well as the list of administrative services planned for offer were approved. All the necessary conditions will be created on the premises, including facilities for the disabled. Regarding available services, there will be the following: registration of land ownership rights, registration of place of residence, civil registration services, and passport issuance. Within two months, we are expecting a station for the issue of biometric documents. The uniqueness of our ASC is that we have the only building control inspector in Zakarpattia Oblast that registers the beginning and completion of first-category construction." Tsiryk also notes that their ASC is the community's investment into their local budget. After all, it will be the community that will earn money from the provision of services, and thus a significant part of the budget for the administrative tax will come to the ATC budget. In turn, expert Volodymyr Feskov claims that, due to the cheaper services, a centre for provision of administrative services can become one of the most important investors in the community's economy. "The services provided by the municipality are paid services. Still, they are much more attractive and significantly cheaper than external ones. A person comes to a ASC or a remote workplace and needs to get a notarial certificate for specific actions. It can actually be done in districts where there is a village elder, which will be much cheaper than by a notary. Therefore, the work of Administrative Service Centres also has a certain social constituent. Despite the lower price of services provided at a ASC, the work of such centres contributes to the revenues of the local budget." Due to various circumstances, not every populated area has opportunities for the creation of a ASC. That is why the practice of establishing a mobile ASC has been initiated in Ukraine. According to Volodymyr Feskov, there is a necessity of mobile_ _Administrative Service Centre in scarcely populated and remote communities, where there is no sense in arranging a separate room: "There comes a car resembling a classical ASC, where there is all the equipment as in standard Administrative Service Centre." There is a necessity to create such mobile Administrative Service Centre in Zakarpattia Oblast as there are many hard-to-reach villages in mountain areas. There are already role models in other regions. In particular, in December 2017, the first ASC "on wheels" in Ukraine started its work in Slavuta, Khmelnytsky Oblast. This project was implemented with the support of the U-LEAD with Europe Program. A Mobile ASC is a special vehicle that is fully equipped with room for two administrators and three visitors that provides 80 types of services in the "single-window" format directly in urban-type communities and villages. According to Viktor Tymoshchuk, an expert at the U-LEAD with Europe Program, Slavuta community was chosen because there are quite a few small villages in the vicinity located far from the city centre. "Thanks to the mobile ASC, residents of these villages do not have to commute 20-30 km to Slavuta to get administrative services." According to Viktoriia Kruta, who heads the Executive Committee of the City Council of Slavuta, the mobile ASC is currently working in test mode. "In this short period, we have already commuted to disabled people. In the near future, we plan to start submission of documents and passports issuance in the mobile ASC. There will also be an opportunity to register a newborn child without leaving home," says Viktoriia Kruta. The mobile ASC in Slavuta ATC will cover five routes that involve 20 populated areas and 8,000 residents. A similar format for covering small remote villages is the best option for the mountain communities of Zakarpattia. The next round of selection of participants for the U-LEAD with Europe Program took place in March. The new phase of the Project will last till 2020 and expects support for the creation and modernization of up to 600 Administrative Service Centres and their provision with information and communication infrastructure. Territorial communities of villages, urban-type communities, and towns with 5,000 to 50,000 residents from 22 regions of Ukraine will be able to join the Project. As such, the chances for success of administrative reform in Ukraine are increasing. The story of creating a modern ASC in Tiachiv is a great example for the other communities that are only just planning to facilitate this innovation. More funds for education, healthcare, and infrastructure in local communities - these are only few of decentralization`s effects on modern Ukraine.